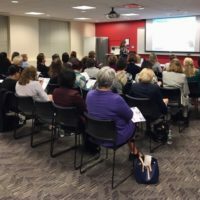 I was thrilled to see more than 50 supportive, excited ladies at our recent Fall Forum on October 3. 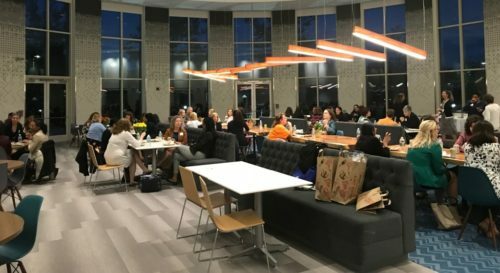 It was a big night for our Women in Healthcare Management group, as we are entering into a “new year” with steering committee leadership and volunteers. This year, we decided to put additional structure around the needed volunteer positions, with job descriptions and time commitment asked of each position. We have asked ladies who volunteer for positions to commit to a year of helping out – October to October. At the October 3 dinner, we announced our new volunteers, and I was happy to introduce the very capable, very organized woman who will be taking over my role as President/Chairwoman, Jen Pendleton. I’ve served as Chair for 3.5 years, and before that, technology chair for 7. I have seen firsthand the positivity and sense of community around our events and the relationships that grow out of those events. There is much to be said for a community of women who lift each other up and support each other in times of need, and I will certainly be remaining an active member and part of the WHCM family. 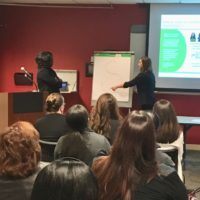 I also wanted to briefly summarize our two breakout sessions from the Oct 3 Forum, presented by talented women who lent their time to grow the knowledge of our membership. We had Laura Willis, Brand Strategist / “Core” Counselor from a business she started, Encore Revolution, discuss personal brand and how to balance your true self with the image you present to your work and professional life. In the second session, we had Busayo Ola Ajayi, MS, SCP, SPHR, Director, Talent Acquisition, Diversity and Inclusion at Boston Medical Center and my friend Kaylee Davis, Business Development Manager from the Addison Group talk about getting hired – what are advanced strategies for finding and landing a job you love, and how to navigate that search/interview process. I thought both sessions complimented and echoed each other. Kaylee and Busayo discussed the S curve career trajectory which happens to us at any job – at first the job is new and you are in the low part of the S – you don’t know much, then you are accelerating and learning, then leveling off again. You want to think about your next career step before you are ready to make your next move – this puts you at an advantage. They discussed words to use on your resume like ‘earned’, ‘saved’, ‘achieved’ and how what keywords you choose in your bio and on LinkedIn can help you shape your brand. Laura took the brand discussion one step further and linked it to interactions and networking. Whomever you are talking to is your “target audience” – you can build a communication bridge by finding common ground – pets and kids are usually good places to start. Think about the “so what” – you have XYZ as a strength, but what does that mean to the person you are talking to? I look forward to the upcoming year and future networking events with all of you!